Resins are the creme de la creme for ritual use. They are 100% pure-no dyes, perfumes, chemical, salt petre, or sulphur. Dragon's Blood is an incense used for protection, money and love; the only incense that covers all of the spectrum! A great way to save money, and a must for the magickal cupboard! Crush it to make a magickal dye or an ink. These chunks were cracked off the 8 ounce tear pictured by me...it's the real deal. This dragon's blood resin is produced from the rattan palms of the genus Daemonorops of the Indonesian islands and known there as jerang or djerang. It is gathered by breaking off the layer of red resin encasing the unripe fruit of the rattan. The collected resin is then rolled into solid balls and shaped into "tears" before being sold. In ancient China warriors would carry this with them always for its ability to congeal blood from wounds and relieve pain, as well as for ink. 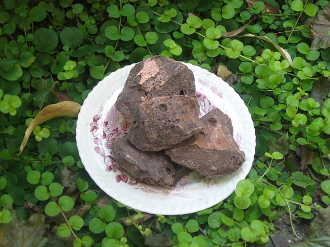 It was considered to be a powerful aphrodisiac and was also reputed to posses the power to make an errant lover return. A piece was often used under the mattress as a cure for impotency. These chunks should be broken up (tap them lightly with a hammer while they are in their bag) Then place a small piece on a charcoal briquette. The ONLY way you can use this incense is on charcoal, it is pure resin there is no salt petre to ignite as with stick incense. You will receive 1/2 an ounce of resin with 2 charcoal briquettes to get you started. The tear pictured is just an example as to it's authenticity and quality. ***A small piece (pea size) produces a lot of scent and smoke, ventilate well in case you are sensitive. thanks for looking! Â© Conjured Cardeaâ„¢ 2009. No part of the content, designs, photographs, product trade name(s), trade product design(s), intellectual property, and product(s) can be used without prior express written permission. All rights reserved.